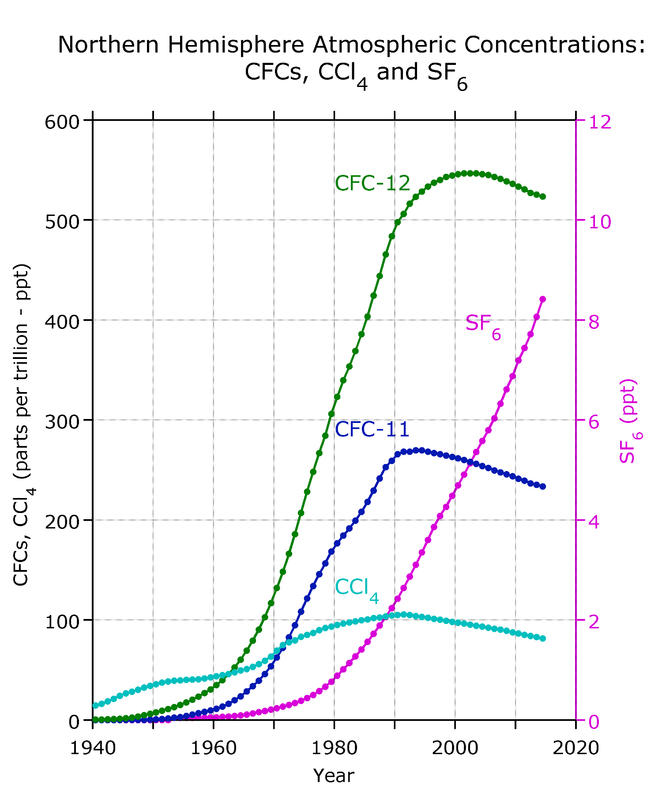 Northern Hemisphere Atmospheric Concentrations: CFCs, CCL4 and SF6. Each of these compounds has a unique history of increase in the atmosphere: https://www.nodc.noaa.gov/ocads/oceans/CFC_ATM_Hist2015.html Restrictions on CFC production and release in the 1980’s slowed CFC-11 (F11) and CFC-12 (F12) growth in the atmosphere, while sulfur hexafluoride (SF6) has continued to increase rapidly. These compounds dissolve in the surface ocean and measurements of the concentrations and ratios of these compounds can be used to provide useful age and rate information for oceanic processes.